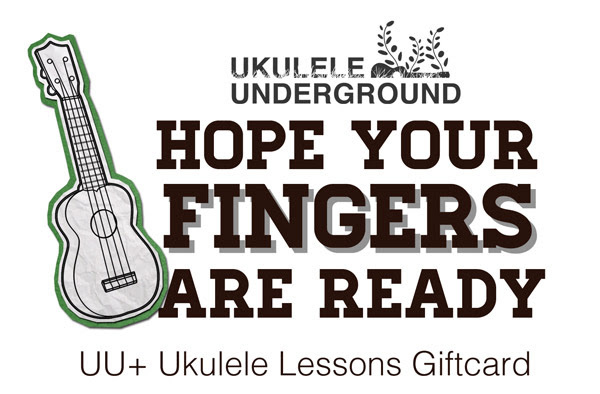 If you have a loved one who is super excited about the ukulele, a gift subscription to UU+ is the perfect gift this holiday season! We’ve been teaching people how to play the ukulele online for almost 10 years now and many of our students, who started with us when they first bought their first ukulele, have gone on to become international touring musicians, join bands, or become ukulele teachers in their own right. If you want to help your friend or loved one finally learn an instrument and become the musician they have always wanted to be, we can help them quickly and efficiently achieve that goal. We’ve taken out all the guesswork of learning how to play the ukulele, we’ve figured out what works and what doesn’t so they won’t have to waste anymore time trying to figure it out on their own. 1. A Huge Video Tutorial library to help them quickly learn to play the ukulele. 3. Live lessons every week to get their questions answered. 4. A customized learning plan created by our staff to help them learn exactly what they want to learn. 5. Top notch on site customer support so they can contact us whenever they feel stuck. Purchase your Gift code today!